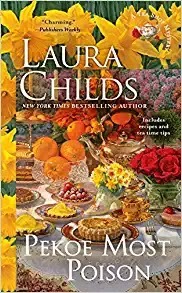 "When Indigo Tea Shop owner Theodosia Browning is invited by Doreen Briggs, one of Charleston's most prominent hostesses, to a "Rat Tea," she is understandably intrigued. As servers dressed in rodent costumes and wearing white gloves offer elegant finger sandwiches and fine teas, Theo learns these parties date back to early twentieth-century Charleston to promote better public health. But this party goes from odd to chaotic when a fire starts at one of the tables and Doreen's entrepreneur husband suddenly goes into convulsions and drops dead. Has his favorite orange pekoe tea been poisoned? Theo smells a rat. And as she reviews the guest list for suspects, she soon finds herself drawn into in a dangerous game of cat and mouse..."
In addition to a good plot with a clever twist, there is all the the scrumptious tea shop food, including recipes at the back of the book. I picked the one calling for a cup of chopped, cooked chicken. I frequently roast a whole chicken and then need to find ways to use the left-overs without getting into a boring rut. 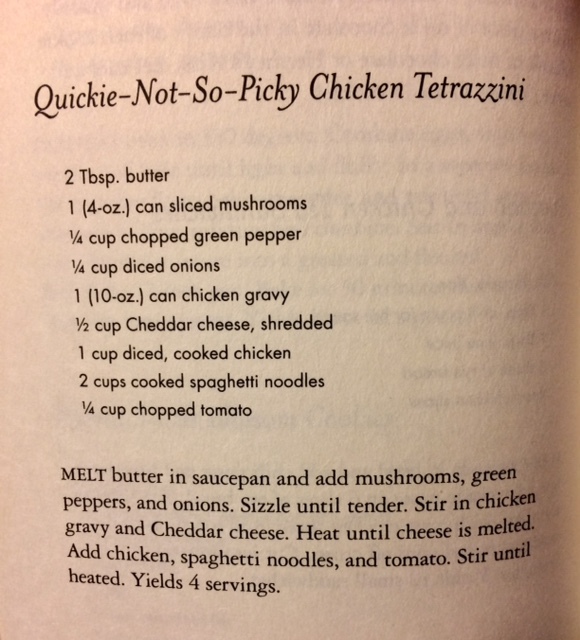 So, we have Quickie-Not-So-Picky Chicken Tetrazzini. First off, we do the Mise en place, which I've found is indispensable, especially for the "Quickie" part to work. Though my picture only shows the vegetable portion of it. 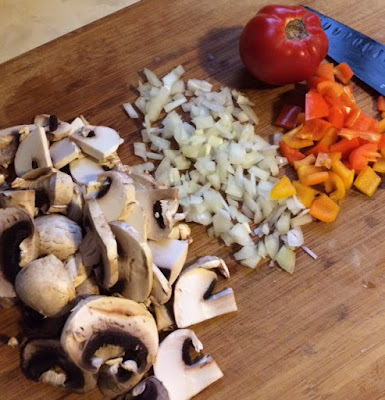 Here's the tasty recipe, courtesy of Laura Childs from Pekoe Most Poison. 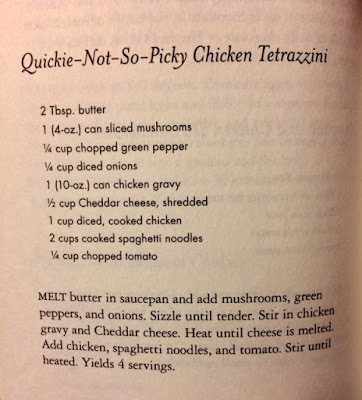 A pretty simple, and easy recipe. Luckily, I had everything, only substituted red and orange sweet peppers for the green bell. 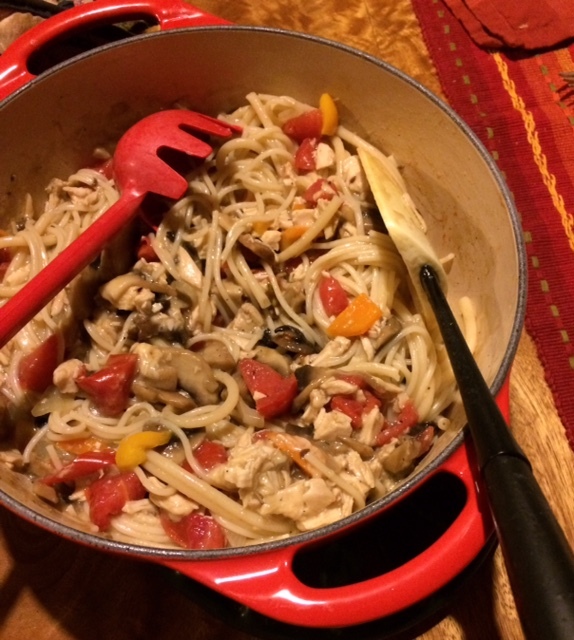 A great week night supper, using your cooked, left-over chicken. 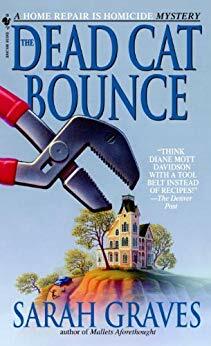 I'll be sharing this with the group at Beth Fish Reads for her Weekend Cooking event, and with Heather on her April edition of the Foodie Reads Challenge. Check out good book and eating suggestions there. 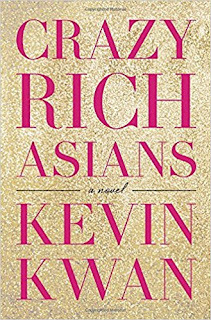 Our current Cook the Books Club pick is Crazy Rich Asians, by Kevin Kwan, hosted by moi, with a Movie tie-in to Food n' Flix, hosted by Debra of Eliot's Eats. The people featured in this novel are not just rich, but crazy rich. Also, some of them, plain crazy. But, happily for our purposes at CTBC, Singaporeans are food obsessed. Lots of fabulous food is eaten, discussed and argued over, another local pastime. This over the top romp mostly takes place in Singapore around the marriage of the century. And two New Yorkers, NYU college professors, are heading off to participate in the extravagant event; Nicholas (the Best Man) and Rachel, his girlfriend, (who is clueless about his crazy family). Even though Nicky's cousin Astrid has clearly warned him; "You can't just throw Rachel in the deep end like this. You need to prep her, do you hear me?" He doesn't see the need. He has been raised not to talk about money. His family are traditional and very private. They don't do media interviews or seek publicity. The wealthy people in Singapore are divided between the filthy rich old family Singaporeans, the recent Chinese emigres "mainlanders", and assorted Malay royalty. 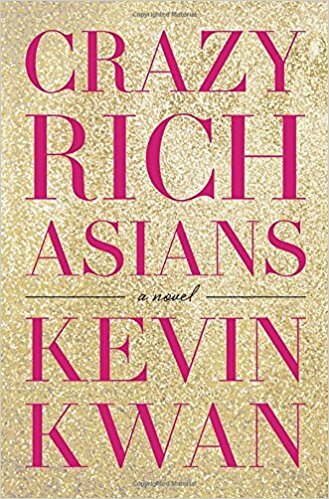 So we're given a look at the Asian jet set, with plenty of snobbery, greed, ridiculous spending, nasty gossip and rude behavior, but balanced out with large doses of humor and sarcasm, thanks to Mr. Kwan . In the end, it becomes quite clear that money may help, but it is not making people happy or nice. Kwan's novel is, at heart, a romance in the best sense, tried and true in the end. The food was fabulous as well, with mentions of enticing street vendor snacks and meals, Malay, Indian and Peranakan (Straits Malay) cooking as well as elegant Chinese home and restaurant delicacies, even "Pacific Rim fusion molecular cuisine" makes an appearance at the Wedding banquet. I fondly remember the wonderful food we had in Malaysia and Singapore, quite a few years ago. The street food from outdoor vendors was amazing, with crispy sweet banana fritters and spicy fried noodle dishes; not to mention great area restaurants serving Peranakan, Chinese, Indian and Malay specialties. As Charmaine Solomon says in her Complete Asian Cookbook: "The most interesting food, because it is peculiar to Singapore, is the Nonya style of food - a mixture of Chinese ingredients and Malay spices, cooked in a way that is a perfect mingling of the two cultures. This came about quite naturally, because when Chinese labor was recruited in the last century, it was only men who were allowed to leave China and come to the Straits Settlements of Penang, Malacca and Singapore. They married Malay wives and these alliances resulted in a singular and quite distinctive style of cooking, a cuisine that the Nonyas are proud of and cannot live without. Nonyas are Straits born Chinese. The women are 'Nonyas', the men 'Babas' and together they are known as 'Peranakan'." This is cooking I especially appreciate as many of the spices are growing in my gardens. 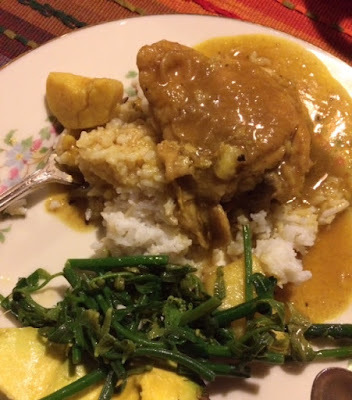 I posted a Malaysian recipe once not too long ago, so it's high time for another Peranakan meal! In my Malaysian 2 Cookbook, I noticed many of the recipes instruct to pound some of the ingredients ahead and then fry before adding the rest. Below you can see my "pounded" spices (actually whizzed in my food processor), with the curry leaves added on the side, ready to be fried. This for my book inspired dish of Malay style Chicken and Sweet Potato Stew with coconut milk. Mix the flour and spices on a piece of waxed paper and dredge the chicken in it. In a large pan, heat the oil over medium high heat until hot, but not smoking. Add the chicken pieces in a single layer, without crowding the pan, in two batches if necessary. Fry until browned on each side (3-4 minutes per side). As it browns, remove to a plate. Set aside. 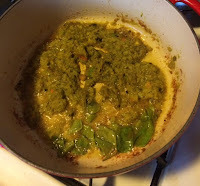 Lower the heat to medium and fry the curry leaves and pounded ingredients, stirring constantly, until fragrant, 2-3 minutes. Add the stock. sweet potatoes and browned chicken. 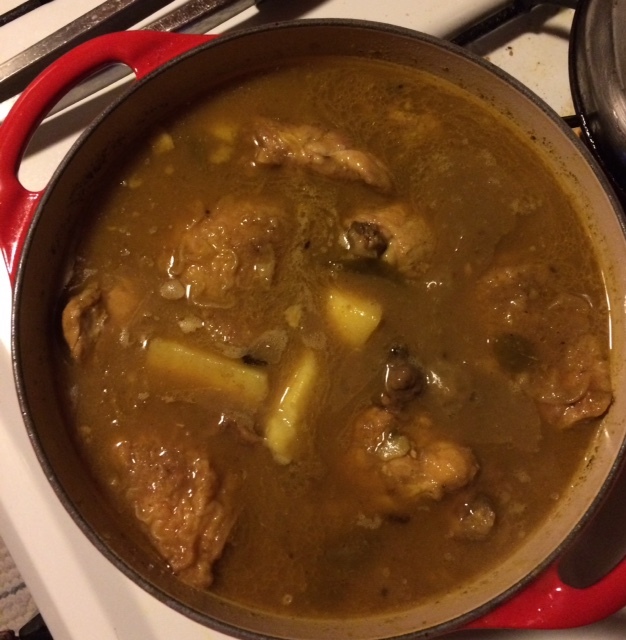 Reduce heat to simmer and then add the coconut milk. Cook for about 1 hour, covered, until the chicken is cooked through. Remove from heat, mix well and serve with rice. 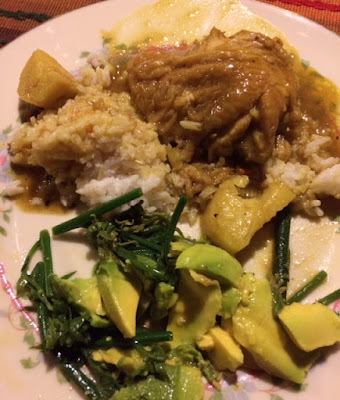 We enjoyed our reminiscences of Singapore and Malaysia with this meal, to which I added a side of fiddle leaf ferns and avocado, tossed with my special South East Asian style dressing. Very yummy, and it's good there were enough left-overs for another dinner. This is my contribution to our Cook the Books Club online feast in celebration of the current selection: Crazy Rich Asians! There's still time if you'd like to join the party. Deadline is March 31st. Just read the book and post about a dish it inspires you to make. Any questions, check the Guidelines tab at the above site link. I'll also be linking up with Beth Fish Reads for her Weekend Cooking event, and with Heather at the March edition of her Foodie Reads Challenge. Check out some good cooking and reading ideas..
"People in Eastport do not think the telephone grows naturally out of the tympanic membrane, and some of them will actually decide whether to answer it or not based on what sort of news they are expecting." and further down: "I think Ellie added, 'we should make sure the man is really dead.' This struck me as pointless, since an ice pick in the cranium promised little in the way of future prospects. But Ellie was determined; it was part of her down east Maine heritage, like being able to navigate in the fog or knowing how to dress out a deer." 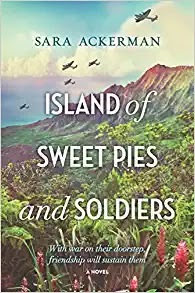 Our latest selection for Cook the Books Club is Island of Sweet Pies and Soldiers, by Sara Ackerman, hosted by fellow Hawaii blogger, Deb from Kahakai Kitchen. Especially interesting to me as a resident on the island where this all takes place - The Big Island! And so fascinating to visit a familiar locale at this time in the past. I don't believe I've ever read a book dealing with WWII and its impact on Hawaii, particularly The Big Island. "Hawaii, 1944. The Pacific battles of World War II continue to threaten American soil, and on the home front, the bonds of friendship and the strength of love are tested. Violet Iverson and her young daughter, Ella, are piecing their lives together one year after the disappearance of her husband. As rumors swirl and questions about his loyalties surface, Violet believes Ella knows something. But Ella is stubbornly silent. Something—or someone—has scared her. And with the island overrun by troops training for a secret mission, tension and suspicion between neighbors is rising. Violet bands together with her close friends to get through the difficult days. To support themselves, they open a pie stand near the military base, offering the soldiers a little homemade comfort. Try as she might, Violet can’t ignore her attraction to the brash marine who comes to her aid when the women are accused of spying. Desperate to discover the truth behind what happened to her husband, while keeping her friends and daughter safe, Violet is torn by guilt, fear and longing as she faces losing everything. Again." I had family over and prepared them a Hawaiian themed dinner. 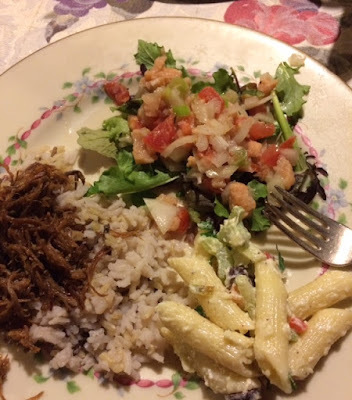 Kalua pork, Lomi Lomi Salmon, Macaroni Salad (local style) and Coconut cake. The Kalua pork was a first for me, and made in the pressure cooker. Traditionally, a whole pig would be slow cooked, overnight in an imu (a large rock and banana leaf lined pit in the ground, as they did in the book for their Christmas party). Much easier to start with some locally sourced, free range pork shoulder roast, a few banana leaves and some liquid smoke. Oh yes! It totally worked. "After surviving the accident that took her mother’s life, Claire Broussard has worked hard to escape her small Louisiana hometown. But these days she feels something is lacking. Abruptly leaving her lucrative job in Chicago, Claire returns home to care for her ailing grandmother. There, she unearths a beautiful piece of artwork that her great-grandfather sent home from Paris after World War II. At her grandmother’s urging, Claire travels to Paris to track down the century-old mask-making atelier where the object, known only as “L’Inconnue”—or The Unknown Woman—was created. 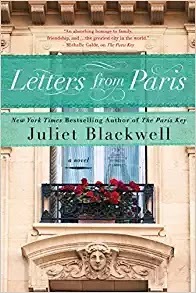 Under the watchful eye of a surly mask-maker, Claire discovers a cache of letters that offers insight into the life of the Belle Epoque woman immortalized in the work of art. As Claire explores the unknown woman’s tragic fate, she begins to unravel deeply buried secrets in her own life." Welcome, glad you stopped by! Find out how you can support. On Mother's Day my daughter gave me a lovely pair of earrings made by the women at Starfish Project. So I was able to learn something at the same time, about a wonderful rescue outreach to sexually abused and trafficked women. You can click on the link and find out more.